In this tutorial, you will learn about different approaches you can take to solve a single problem using functions. Consider a situation in which you have to check prime number. This problem is solved below by making user-defined function in 4 different ways as mentioned above. // Return type of function is void because value is not returned. In the above program, prime() is called from the main() with no arguments. prime() takes the positive number from the user and checks whether the number is a prime number or not. Since, return type of prime() is void, no value is returned from the function. In the above program, prime() function is called from the main() with no arguments. prime() takes a positive integer from the user. Since, return type of the function is an int, it returns the inputted number from the user back to the calling main() function. Then, whether the number is prime or not is checked in the main() itself and printed onto the screen. In the above program, positive number is first asked from the user which is stored in the variable num. Then, num is passed to the prime() function where, whether the number is prime or not is checked and printed. Since, the return type of prime() is a void, no value is returned from the function. 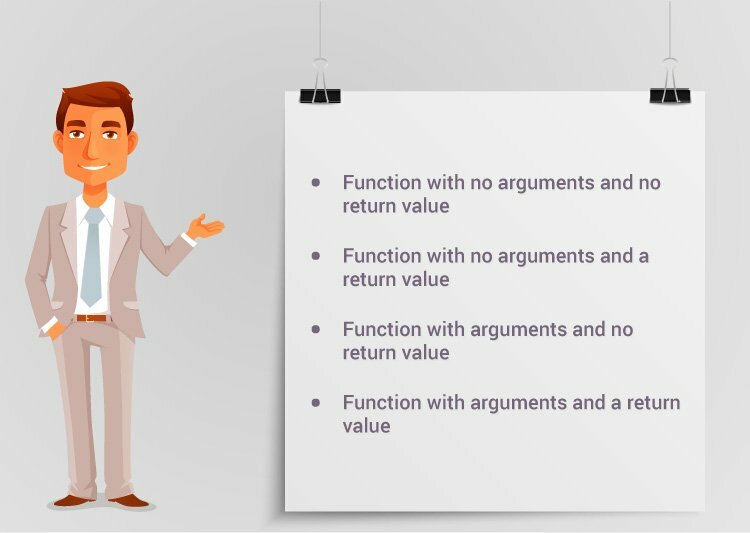 Example 4: Arguments passed and a return value. In the above program, a positive integer is asked from the user and stored in the variable num. Then, num is passed to the function prime() where, whether the number is prime or not is checked. Since, the return type of prime() is an int, 1 or 0 is returned to the main() calling function. If the number is a prime number, 1 is returned. If not, 0 is returned. Back in the main() function, the returned 1 or 0 is stored in the variable flag, and the corresponding text is printed onto the screen. All four programs above gives the same output and all are technically correct program. There is no hard and fast rule on which method should be chosen. The particular method is chosen depending upon the situation and how you want to solve a problem.